The City Line would be a new line created by joining two existing ones: the Waterloo & City line and the Northern City Line; and one closed line - the Great Northern section between Finsbury Park and Alexandra Palace. The idea is not new. In 1913, the Metropolitan Railway (MR) purchased the GN&CR (Great Northern and City Railway) and revived a plan to extend the Northern City Line southward to a terminus at Lothbury in the City as part of a number of plans to connect the GN&CR to the Waterloo & City Railway (W&CR) and the Metropolitan Railway itself. When the Metropolitan Railway Act, 1913 was passed neither of the proposals for connections were permitted, but Lothbury station was allowed, as the terminus station. In 1914, The MR introduced revised proposals for its connections between the GN&CR and the MR and W&CR which removed the need for a station at Lothbury. Although these connections were never made, the Lothbury station idea was not revived again. In the 1930s London Underground unveiled an ambitious scheme of new projects called the New Works Programme. Amongst several new routes was an extension to the Northern City Line from Finsbury Park to Alexandra Palace. The track already existed and operated a steam driven service. The existing line from Moorgate to Finsbury Park was integrated into the Northern Line and preliminary work began but post-war austerity eventually led to the scheme being scrapped in the 1950s. The track was torn up and the service dropped altogether. More recently the Green Party has proposed that the Northern City Line be connected to the Waterloo & City line to create a new cross-London heavy rail route, something akin to the Crossrail scheme. The core section of the route would be from Finsbury Park to Clapham Junction via Moorgate, Bank and Waterloo, with a new connection at Blackfriars. Through services could then run from Welwyn Garden City and Hertford North to destinations like Hounslow, Richmond, Shepperton, Kingston and Weybridge. It would retain the aspect of a mainline railway. 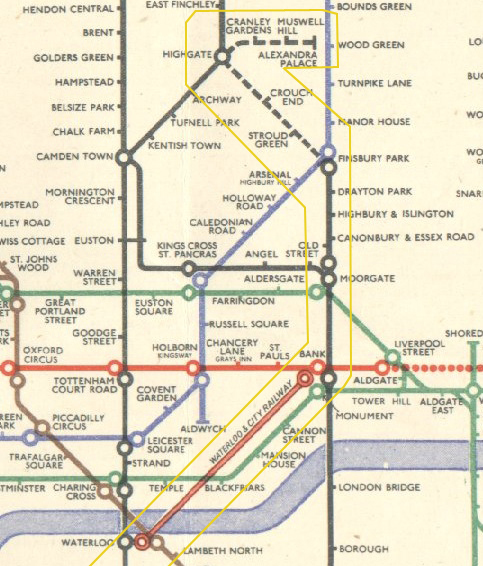 Existing infrastructure for this proposal was clearly evident on 1946 tube maps. This proposal is to, similarly, link up the two lines as proposed by the Metropolitan Railway, Lothbury station notwithstanding, and in addition connect to the Great Northern stretch from Finsbury Park to Alexandra Palace. However, in this instance it would be a "tube" line, operated by London Underground. It would certainly be preferrable to expand the bore of the tunnels to allow larger than standard profile trains, however the cost of such an undertaking might well rule it out. It is worth mentioning also that the platform alignments on the Waterloo & City line at both Waterloo and Bank are unsuitable for this scheme and the line would require new spurs and platforms at either end for a suitable alignment. Extensions northward and southward are envisaged. In the north, to run from the original terminator tunnels at Finsbury Park (not the surface platforms currently being used) via the old 'Northern Heights' route (which is mostly in cutting and unobstructed), through rebuilt station sites at Stroud Green and Crouch End, interchange at Highgate, before plunging into tunnel under Queens Wood to a new underground station at Muswell Hill and on to Alexandra Palace for interchange with National Rail. The line could then terminate at Wood Green where it would meet the Piccadilly Line. The southward section from Waterloo would require a substantial new tunnel via Battersea, Clapham Junction, Wandsworth and Roehampton, all areas never reached by the Underground before. 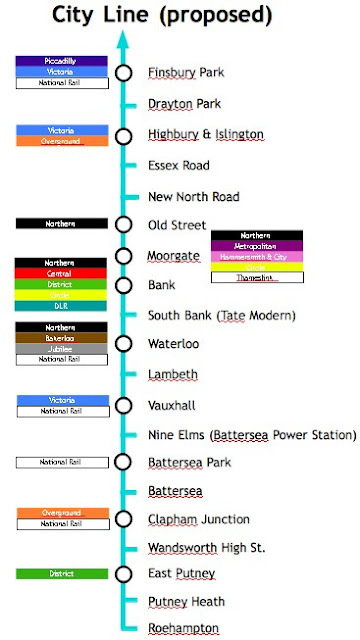 New stations could be incorporated on the existing stretches, at the South bank/Tate Modern and at New North Road. The scheme does of course require alternative routing for mainline services from Hertfordshire currently terminating at Moorgate. The surface platforms at Finsbury Park would still be usable and Kings Cross or St. Pancras would seem to be the logical alternative. What this proposal would give would be a very useful link through the City of London, connecting many 'new' neighbourhoods screaming for tube services, such as Muswell Hill, Crouch End, Battersea, Wandsworth, Roehampton University, with the added bonus of serving entertainment venues on the South Bank, Battersea Power Station and the new Arsenal football stadium. Tunneling of new link between Moorgate and Bank, incorporating new N-S aligned Bank platforms. Exit tunnel from Finsbury Park northbound onto the disused Northern Heights route. Rerouting mainline trains from NCL to Kings Cross/St. Pancras. City Line opens, Highgate high level - Waterloo. Northbound tunnel to Muswell Hill and Alexandra Palace. South west extension to Roehampton via Battersea. ADDENDUM: as of late 2010, this scheme to extend the Northern Line to Battersea would potentially conflict with this plan. Appetite for another line through this part of Battersea is likely to be very low if the Northern Line extension is carried out. The Nothern Line plan does miss an opportunity however, in stopping the line at Nine Elms. A relatively simple extension of the line a couple of stops west would carry it to Clapham Junction. Experience shows that short and simple extensions of this type are rarely carried out afterwards and of course, cost far more to do in two phases. Given the limitations and over crowding of the current W&C line, would it not be cheaper and make more sense to build a new relief line from Morgate to Waterloo with interconnects at St. Pauls and Blackfriers? To the south this can then take over the slow lines via Wimbledon and Putney. To the north it can use the disused North Heights route from Finsbury Park to Highgate and then take over the Northern Line to High Barnet. The line between Highgate and Finchley Central could be four tracked and a shortened Northern line turned round at Mill Hill East. To raise the money for this the Northern line could then be extended from Mill Hill East into the Totteridge greenbelt and a new suburb could be built there. Buy the land as green belt and then sell it with planning permission and a new rail connection into the City. My main objection would be that a parallel route to the W&C does not seem necessary, whereas the W&C, being a 2 station affair is an underexploited, extant route. This scheme is a notional 'joining the dots' if you will, intended to maximise the utility of existing assets, whilst not overcrowding an already very complex little hub of routes through the City. It's not possible to run the Northern City line using the disused stretch of tunnel between Drayton Park and Finsbury Park. In the 1960's the Victoria Line was built and some platform swapping took place, the Northern city line platforms are now used by southbound Victoria line and Piccadilly lines and vice versa. This means those tunnels are now obsolete as the Victoria line and Piccadilly line completely obstructs this part of the tunnel. Extending the Victoria line or Piccadilly Line to Moorgate via the Northern City line would be prohibitively expensive due the arrangement of the tunnels and platforms at Finsbury Park. The Northern Heights section is another problem, majority of it now is classed as a nature reserve and the tunnels at Highgate house bats which cannot be moved by law. So a lot barriers are in the way of this. The line between Highgate woods and Alexandra Palace is also a no go as houses,schools,garden centre and more houses all sit on the site. It will be very expensive and problematic at constructing this now, it should have happened in the 1970's at the latest and now its a missed opportunity. As for connection to the Waterloo & City line, this has been already been explored on three occasions and unfortunately the line terminates at Moorgate because the Northern Line tunnels run beneath princes street. The idea of the line going towards Wandsworth is a good idea and this can be done by extending the Northern Line from Battersea Park. Crossrail 2 has been proposed to go from North East London to South West London and has recently stalled because many people in Chelsea think it would spoil the local community and street scene and cause too much disruption. And finally anyone with ideas of extending the Northern Line north of Edgware and west of Mill Hill Pages Street will be disappointed to know that majority of this land has been built on and Lyndhurst Park,Mill Hill Broadway to Edgware is now a nature reserve, the land from Edgware Way to Bushey Heath is now Green belt land and there is very little in the area surrounding Brockley Hill and Elstree South and thus would not be commercially viable. A more significant problem is the escalator to the Crossrail platforms at moorgate - which goes straight through what would be the running tunnel for the northern city line, right next to the end of the existing track, so close that a by-pass would be impossible. With regard to Princes Street, though, that's no longer a problem with the bank capacity enhancement project - the southbound northern line is diverted under a building instead, meaning the existing southbound line will no longer be in the way. GREEN BELTS UNDER THREAT - WHAT TO DO?